Encik Reza Abdul Rahim was first appointed as the Senior Vice President of the Offshore Construction and Subsea services Division of Sapura Energy in 2012. 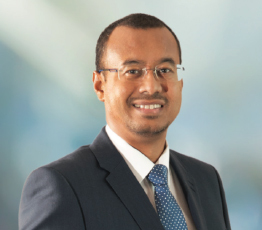 In 2015, he was appointed as the Senior Vice President, Group Strategy and Regional Development prior to assuming his current position as the Group Chief Financial Officer/Senior Vice President, Group Finance and Strategy on 1 June 2016. Prior to the merger of businesses between SapuraCrest Petroleum Group and Kencana Petroleum Group, Encik Reza was Acting Chief Executive Officer for Oil and Gas Construction Services of SapuraCrest Petroleum, Chief Executive Officer for Energy Ventures and Operations of SapuraCrest Petroleum and Group Chief Operating Officer of Sapura Group. Encik Reza has experience in audit, financial management and corporate finance. Previously, he was Senior Vice President and Head of Group Corporate Finance at Axiata Group Berhad and prior to that he was Chief Financial Officer of Sapura Holdings Sdn Bhd and Group Financial Controller of Sapura Technology Berhad.